HISTORY OF THE GELEDI. 2. SULDAAN YUUSUF MAXAMUUD IBRAAHIM about( 1800-1848) In the first article we saw how the Geledi people settled on the banks of the river Shabeelle, in the town that is now known as Afgooye, where they liberated themselves from the rule of the Silcis and became allies of the Wacdaan clan who had settled on the opposite bank of the river. By counting the generations we can tell that this must have been towards the end of the 17th century CE (11th century AH). The Geledi went on to prosper and became a small city state whose wealth rested on farming and trade. The rich soil of the river bank produced abundant crops, and their settlement was located at the point where the important caravan route from the interior to the port city of Mogadishu crossed the Shabeelle river, so that it became a major market and its rulers collected tolls from the caravans. It also made them rivals of another powerful clan, the Biimaal, who controlled the parallel trade route to the port of Marka. The Geledi had their own system of government. At the head of the community was - and still is - the man known as the Sheikh or the Suldaan. This double title shows that he is both a religious and a political leader; but he is no absolute ruler, but rather the 'first among equals'. For about three centuries this role has been held by a member of the Gobroon lineage. The most famous Suldaan of the Geledi was Yuusuf Maxamuud Ibraahim, who reigned in the early part of the 19th century CE (13th AH). It was Yuusuf who led the Geledi to become the dominating power in southern Somalia at the time. His authority rested on a combination of political and military ability with a reputation for religious baraka and knowledge of divination and mystical arts (wardi and tacdaar or asraar). At this time the Somali coast was nominally under the rule of the Omani Sultans of Zanzibar, but in reality their rule did not mount to much and certainly did not extend inland. The formerly great city of Mogadishu (Xamar) had declined into a very poor condition, so that the real power passed to the Geledi inland, and Yuusuf was able to take advantage of that. ‘I enjoyed following the paths which ran through the village, ... irregular and capricious as an arabesque design. The picturesque appearance of this barbarian city, dotted here and there with trees, shrubs and little patches of millet or sesame, was not without charm. the gaiety of the facial expression of the inhabitants, the vivacity of their gait, gestures and speech; the women, carrying jars on their heads1 to fill them in the river; the great oxen, the donkeys with their loads, the lines of camels making their way through the fields or fording the river, followed and urged on by their drivers with long slender spears; and then, in the midst of the groups of huts gilded by the sun, clumps of greenery where a multitude of brilliantly coloured birds fluttered, sometimes hanging their nests on the very tips of the branches which overhung the river; and finally the river itself, with its deep bed, its winding course, its steep banks edged with a border of dense bushes; rolling its muddied waters, constantly stirred up by the trampling of men and beasts on their way across; all this formed a picture as cheerful as it was animated...’ In his book about his journey he also published a picture, showing a view of Geledi which was still recognisable until recently, though there have been so many changes, and the town has grown so much. From this base, Yuusuf made Geledi the centre of a network of alliances extending over most of southern Somalia. By 1842 he was able to lead out an army of about 8,000 men to help settle a succession dispute in Mogadishu. The next year came his most famous achievement, the victory over the community of Baardheere on the Jubba river. This was a religious brotherhood, 'jamaacad', founded in the 1820s. By the 1840s it was headed by Sharif Ibraahim and Sharif Cabderraxmaan, whose zeal to reform the way of life of the southern Somali peoples, and bring it closer to true Islam as interpreted by the brotherhood, won them devoted support, but also violent hostility. The brotherhood forbade dancing and the chewing of tobacco. Its women members covered their faces with veils and their legs with a kind of trousers. Sheikh Ibraahim also forbade the handling of elephant or hippopotamus tusks, since these were unclean animals. This proposal would have ruined the ivory trade, and it therefore made him an enemy to trading clans like the Kasar Gudda of Luuq. He had started to impose these reforms by force on the surrounding clans, and had captured the city of Baraawe, where the inhabitants were obliged to obey his orders. It was naturally to Yuusuf, as the strongest ruler in the area, that other clans turned for protection and leadership. It was not just a matter of trade and economics. He too was a religious leader, and was defending a more traditional kind of Islam, angrily rejecting the accusations of the Sheikh of Bardheere that he was an 'infidel'. A large army from a wide alliance of clans gathered to Yuusuf; the whole country, it was said, was empty of men of fighting age - only old men, women and children were left. They besieged, attacked and defeated the Baardheerans, killed their leading sheikhs and burnt the settlement to the ground (though it was later revived). Many stories are told about this campaign, for instance that Yuusuf's army had with them four large haan milk vessels filled with bees. They opened these and the bees flew at the Baardheere army, driving them into panic. Ever since, the Gobroon Sultan is praised as 'shinni duuliow', 'who makes war with bees'. The fame and prestige of this victory were immense. For the next few years the Geledi were far the strongest power in the region, and most of the other clans hurried to become allied with them. However, enmity continued between them and the Biimaal clan, who had supported the Baardheerans. Yuusuf, once again at the head of an army drawn from many clans, attacked Marka early in 1847; the Biimaal were defeated,and the city surrendered. But the main body of the Biimaal, who lived outside the town, had not submitted to him. The following year, Yuusuf, with his brother Muuse, again gathered an army at Golweyn in order to give battle to them. The two armies met at Cadcadey near Jilib, at midday on Friday the 12 May 1848 (8th of Jumaada II, 1264 AH). We know the exact date because it was recorded by Captain Guillain, who received the news just before he left Somalia. The battle was very bloody, the Geledi were routed, and Yuusuf was killed together with his brother Muuse. Dhulkii Cadcadey, dhib aa ku dhahayo Nin oon dhimahayn dhulkiis ha joogo. But there is a tradition that Yuusuf did not die in the battle; he disappeared mysteriously; some old people say that ‘he flew’ – as the greatest sheikhs among the southern Somali – and years later pilgrims to Mecca saw him there. He was such a great man in his people’s minds that they refused to believe in his death. The power of the Geledi never fully recovered from this defeat, though Yuusuf’s son Axmed tried to maintain it until he too was killed in battle in 1878. By the time of the Italian colonial take-over in the 1890s, the Geledi were no longer a major force. However the people of Afgooye and southern Somalia still remember the 'golden age' of Suldaan Yuusuf. Yuusuf’s life is known from local traditions which were told to me in the 1960s and 1980s. It is also known from two contemporary European witnesses: Lieut. W. Christopher,(Journal of the Royal Geographical Society 1844, XI :76-103) and Captain Charles Guillain, (Documents sur l’histoire, la geographie et la commerce de l’Afrique orientale. Vols I, IIa and IIb. Paris,Arthus Bertrand, 1856), but these are hard to access. 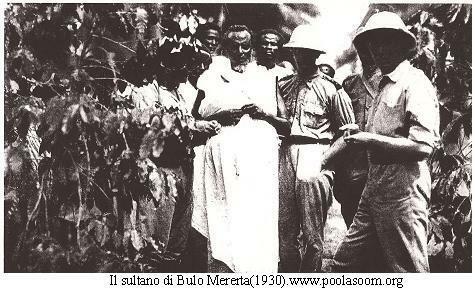 Pietro Barile tells some of the traditions in his book Colonizazzione Fascista nella Somalia Meridionale, (1935. Roma: Societa Italiana Arti Grafiche). He is the source for the poem I have quoted. Maxaa loo colaadinayaa reer Afgooye?. By Axmed Sh. Cismaan Suldaan. QEEXID GUUD: YUUSUF GARAAD SHALAY! !